Mix together in a bowl the garlic, rosemary, wine, honey, mustard, lemon rind and juice – season with some salt and black pepper. Place lamb in zip lock bag with marinade and place in fridge for 2-3 hours turning occasionally. Place the lamb in a roasting tin and pour over half the marinade. Once cooked, remove from the oven, cover with foil and rest for 15-20 minutes. To make the gravy: strain juices from the pan into a bowl. Place pan on medium heat on stove top. Add flour and cook stirring until flour has a golden colour to it approx 3-4min. 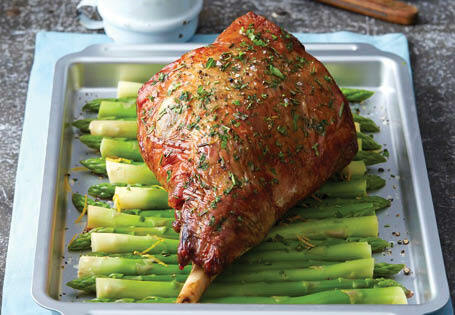 Whisk in lamb juices until smooth consistency. Season to taste.